Sealanes began in 1895 as a small grocery shop, The Roma Fruit Palace in Market Street, Fremantle, Western Australia selling grocery items and importing Italian goods for the local migrant population. 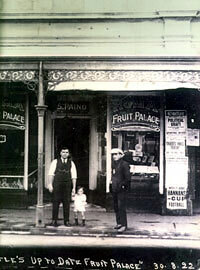 In 1928 the range of goods expanded into selling fresh seafood to local customers and supplying cafes and restaurants. The move to purchase the shop next door resulted in converting the Roma Fruit Palace into a retail fish shop and re-naming it Fremantle Fish Supply. The business continued to experience growth during the 1930s despite the depression. The outbreak of the Second World War was a busy time for the port of Fremantle with many visits by the American and Dutch Navies as well as the Australian Defence forces. It was here that the ship supply business began to grow by supplying seafood and groceries to the incoming vessels. Through the 1950s and 1960s naval contracts increased and the sales of groceries grew as many ships carrying migrants came into Fremantle. During the mid 1960s the business was taken over by the third generation of family members. It soon became obvious that the name Fremantle Fish Supply was not an accurate trading name for a business expanding into general shipping, so a second trading name, Port Providoring began to appear on invoices to ships. With the division of trade, the two main areas of the business became foodservice and ship supply. By the 1970s, the business had exceeded the space of the current premises and the business was moved to Marine Terrace, South Fremantle with a purpose built warehouse and office space in 1972. The company was also renamed Sealanes during this time to link the major activities of food service, wholesale seafood distribution and ship supply. Sealanes began a period of rapid growth during the 1980s, with the expansion of the premises on Marine Terrace and the supply of new markets, such as the visiting Japanese tuna boats and growing tourism to Western Australia and the increase in restaurants, cafes and hotels. In the 1990s with the expansion of visiting crews to Australia, Sealanes opened three branches to supply ships and offshore oil rigs in Port Hedland and Karratha in Western Australia and Darwin in the Northern Territory. In 1993, a Retail Fish Shop was also opened on the premises, reminiscent of the earlier days. The fourth generation of family continued to own and operate Sealanes with a staff of dedicated employees through to late 2016 when a decision was made to sell to Superior Food Services. The decision was not taken lightly, but was seen as an opportunity to expand the business with Superior Food Services able to now offer a national footprint and with that the opportunity to gain more national business.